Methanethiol is a colorless gas under standard temperature and pressure, becoming liquid at 6 °C. It is also one of the main chemicals responsible for bad breath and flatulence. At very high concentrations methanethiol is highly toxic and affects the central nervous system. 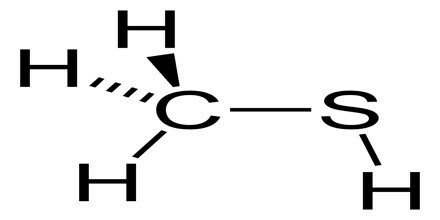 The chemical formula for methanethiol is CH3SH; it is classified as a thiol. Methanethiol is also considered to be a weak acid, with a pKa of ~10. 4. This acidic property makes it reactive with dissolved metals in aqueous solutions. It is a natural substance found in the blood and brain of humans and animals, as well as in plant tissues. It is disposed of through animal feces. It also occurs naturally in certain foods, such as some nuts and cheese. It is one of the main compounds responsible for bad breath and the smell of flatus. 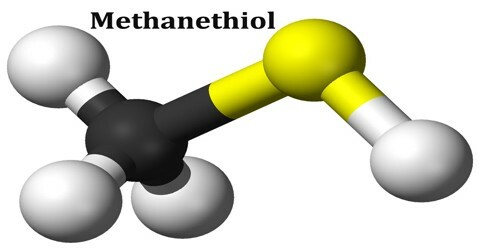 Methanethiol is released from decaying organic matter in marshes and is present in the natural gas of certain regions, in coal tar, and in some crude oils. It occurs in various plants and vegetables, such as radishes. It is a byproduct of the metabolism of asparagus. The ability to produce methanethiol in urine after eating asparagus was once thought to be a genetic trait. Methanethiol is produced by decaying organic matter in marshes and by decomposition of an algal metabolite (DMSP, dimethyl sulfonio proprionate). It is the main sulfur source of some marine bacteria and a possible substrate for methanogenesis. It is manufactured for use in the plastics industry, in pesticides, and as a jet fuel additive. It is also released as a decay product of wood in pulp mills. It is mainly used to produce methionine, which is used as a dietary component in poultry and animal feed. Although impractical, it can be prepared by the reaction of methyl iodide with thiourea. 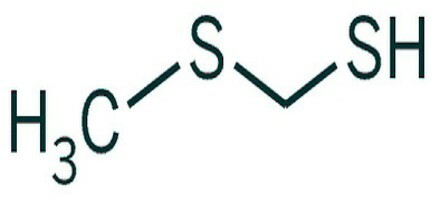 Methanethiol is the primary breakdown product of the algal metabolite dimethylsulfoniopropionate (DMSP). Marine bacteria appear to obtain most of the sulfur in their proteins by the breakdown of DMSP and incorporation of methanethiol, despite the fact that methanethiol is present in seawater at much lower concentrations than sulfate (~0.3 nM vs. 28 mM). Bacteria in environments both with and without oxygen can also convert methanethiol to dimethyl sulfide (DMS), although most DMS in surface seawater is produced by a separate pathway.